Well, this is certainly surprising! After the shocker that was the Infinite Crisis Batman figure, DC Direct has struck again, turning what could have been a run-of-the-mill toy into something better. The beneficiary this time? 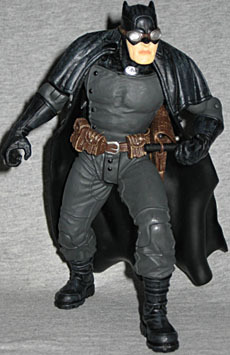 Elseworlds Series 4, and the Liberty Files Batman. As an agent of the US military in the 1940s, Bruce Wayne is willing to sacrifice anything to protect the world from nuclear winter... even his own humanity. Again, the too-brief bio really fails to tell us anything about the character. For instance, that he was never called Batman: in the story, Agent Wayne's codename was "The Bat." A small difference, sure, but one that matters. Along with his partners - codenamed The Clock and The Owl - the Bat was part of a covert unit called the Unholy Three, dispatched to deal with threats outside the expertise of the regular army. For instance, the rumor that Hitler had gained a new secret weapon: an otherworldly Ubermensch. Unlike most Elseworlds tales, JSA: The Liberty Files is actually a trade paperback collection of two limited series. The first was The Liberty File (note the singular), released in 2000, and the second was The Unholy Three, released a few years later. Both two-issue halves of the story were pencilled by Tony Harris, and Dave Cortez has done quite a job of turning that art into a full sculpt. The Bat's design is very nice. The majority of his suit just looks like the sort of uniform soldiers wore back then: big sturdy boots, thick leather pants, a button-up shirt... really, if not for the cape and the cowl, this guy could easily shop at the same tailor as Lobster Johnson. He's wearing big gloves, just like our Batman does, but his utility belt is a more realistic version, with a big silver buckle holding the brown leather strap in place. He doesn't actually have a batsymbol on his chest, for a change - merely a silver disc at his throat. Batman's cowl makes sense in a modern story, but is there a reason (other than the needs of the story) that The Bat would wear something similar? It's the same question we asked for Red Son Batman: "why the ears?" His goggles are glued lightly in place; they're not intended to be removed, but you can do it with some careful work. The eyes beneath aren't painted, but they are fully sculpted - evidence that the goggles were at least considered as a separate accessory. Rather than a regular cape, The Bat is wearing something more akin to a sleeveless trenchcoat. Oddly, it has large buttons down both sides, rather than just one. 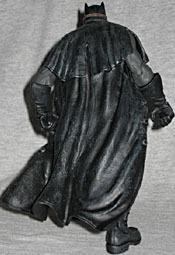 The coatcape hangs and billows realistically; you can tell this thing has weight. It's glued in three places around his neck, but if you're determined, you can pry it off. Why would you want to do that? We'll tell you in a moment. JSA: The Liberty Files: Batman has an impressive assortment of accessories - almost enough to warrant buying him by themselves. 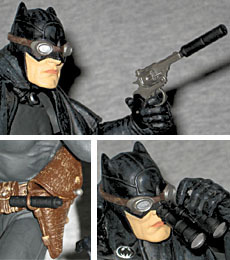 First is a gun - yes, this Batman uses a gun - that fits in the holster at his waist. The holster has a peg that allows you to snap it closed, but the angle of the figure's coat can make getting the gun in or out difficult. He also includes a silencer which fits the gun perfectly. There's even a loop on the front of the holster the silencer can slip into. Is that what it's intended for? couldn't say. Works, though. He has a pair of binoculars, which he can raise to his eyes (with some work), and a machete. And that's where the coat comes back into play. Something you can't see simply by folding the cape up and looking underneath is that The Bat's utility belt has a strap that runs up to his shoulders. What's that for? Well, there's a little square on it about halfway up. Take a look at it, and you can see it's got a small opening. 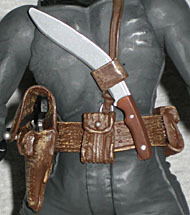 That, my friends, is a sheath for the machete - and the "machete" itself is actually a kukri blade, a Nepalese knife used mainly by the Gurkha warriors, suggesting that Bruce studied fighting techniques of the East in this reality just as he did in the "main" world. The kukri looks like a boomerang, but is not a thrown weapon - the curve of the blade delivers a maximum of force when used for chopping and slashing. In any case, wiggling the weapon into place on his back is hard enough with the coat off; trying it with the coat on would be nearly impossible. The figure's articulation may not seem like anything special just by reading a list: balljointed neck, balljointed shoulders, pin elbows, peg gloves, T-crotch, pin knees, peg boots and pin ankles. No waist, plain hips, no torso, no biceps... sounds kind of dull. But honestly, it's better than it seems. The Bat is designed to have a fairly extreme stance, but the articulation allows him to get out of it, too. It all adds up to a lot of playability, and you can do tons with him. Start playing around, and you'll find a bunch of fun poses; you'll be at it for hours. JSA: The Liberty Files is one of the better Elseworlds stories, with nice, moody art and a story that keeps you guessing. Through the package, this particular Batman looks like a slight tweak on the classic design with a handful of nice accessories, but don't be fooled. This is actually one of the best Batmen (Batmans?) DCD has released in years, and should definitely find a place in your collection.